copystars-dvd-copier has no other items for sale. Integrate the Samsung Spinpoint M5 HM160HC 160GB hard drive into your computer system to expand its storage potential. This internal 2.5-inch hard drive offers a large and secure 160GB of space to store software and accessories however you see fit. These hard drives offer a large, dedicated cache that allows for quick transfer of large and robust programs or files to or from the device. Furthermore, the hard disk offers quick read-and-write functionality thanks to the integrated spin speed of 5400RPM. With up to 160GB of free storage, you have the capacity to store up to 40,000 songs, 200 hours of high definition video, or 25,000 photos. 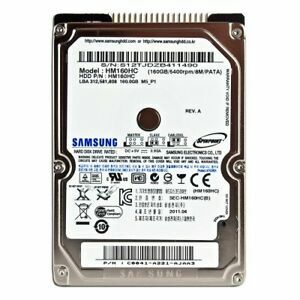 Additionally, you can fill this internal Samsung HDD with personal or important data, programs, or storage-demanding video games.Users thoroughly enjoy the 8MB of dedicated cache, and this makes it easy, convenient, and time-efficient to fill up the device. When fully integrated into a computer, the specifications of the Samsung Spinpoint M5 HM160HC 160GB drives offer an average seek time of 12 milliseconds and an average latency of only 5.6 milliseconds. It isn't hard to install this type of internal HDD in your computer; simply connect the hard disk drive to your personal computer via the Parallel ATA IDE interface. Once the Samsung Spinpoint M5 HM160HC 160GB hard drive is connected to one’s personal computer via the 44-pin IDC interface, users are able to immediately use this device however they see fit on their desktop or laptop computer.More specifically, this hard disk offers up to 103MB/s and up to 100MB/s of external transfer rate performance. Samsung M5 HM160HC 160GB drives are compatible with Windows 7 and many later Windows-supported computers. The device offers roughly 600,000 start and stop cycles and has a reliable MTBF of 330,000 hours.Once this computer component is fully integrated into one’s computer setup, consumers thoroughly enjoy a number of the advanced features that come integrated into the hard drive itself. The computer component offers NoiseGuard technology, which effectively reduces the sound and auditory effect. Secondly, the device features Perpendicular Recording Technology, allowing more data to be stored on this storage device. Next, users of these drives appreciate the integrated SilentSeek Technology, which is fully capable of reducing most sounds generated by the actuator movement while searching the hard drive for data. Finally, the device features the ATA S.M.A.R.T. Feature set, which routinely checks the hard disk drive for issues and notifies the user if any issues arise.The device is more compact than you might think, offering dimensions of 9.5 millimeters high by 69.75 millimeters wide by 100.3 millimeters long, all while staying consistent with the popular 2.5-inch form factor design and weighing roughly 3.39 ounces. Samsung recommends that users operate this internal HDD in an environment that is between 41 and 131 degrees Fahrenheit, as well as in an environment that is between 5 and 90 percent humidity overall. The device is also environment friendly, utilizing less power while in use and consuming significantly less power while in idle mode. 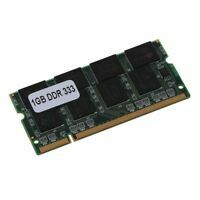 IDE hard drives for laptops are a bit hard to find these days, especially if one wants to score one with the exact size of an existing HD for copy-exact HD backup logistics. This eBay purchase of a used Samsung HM160HC was a success. For a reasonable buy-it-now price, this HD went through the HD cloning process without much problem. The only detour I had to take was to make a small jumper to set it in either the slave mode or cable-select mode. Without the jumper, the IDE controller experienced conflicts with the primary boot drive becasue both drives are in master mode. When they don't fail, they work great! OK, I have to say that this HDD has been a mixed bag for me. I have had to have the original one I bought replaced, and then the brand new, not refurb, replacement just died. Of course, that will also be handled under warranty and replaced, but so far, I am not feeling so confident. Well, like Garp said when the plane crashed into the house, "What are the chances of TWO planes hitting this house?!" All I can hope for is that the errors in the manufacturing process, QC or whatever don't haunt me on the third one. As far as price and performance, I really see no humanly noticable difference between 5400 rpm drives, just as I see no difference between 7200 rpm dirves. Sure Test programs and equipment can tell, but we mortals of flesh and blood cannot notice 3 nano seconds difference, now can we? As for these being the least expensive 160 bg new warranteed HDD for IDE laptops, I have to say that they haven't let me down, until they failed and let me down. In my life, only seagate has yet to send me a drive that has failed. Not that all drive s I buy fail, but all manufacturers drives I have ever have used, Seagate is the only one to have NEVER, EVER let me down. Some other people HAVE had them fail and not Samsung, so, I chose to fight my own personal experience and go with the odds that the 3 new ones I just bought will not fail What are the odds? Best in class capacity expansion for vintage computers. This Samsung 160GB drive replaced a Fujitsu 80GB drive in my ancient (vintage 1999) Compaq 1800T laptop as I needed more space. I am extremely pleased! It runs very cool and is nearly silent. ... ... ... Most impressively, the drive shows no degradation in speed across the entire surface of the drive using the HD Tune Pro 4.6 Benchmark test. Note that all this means is that my legacy rig cannot handle the maximum transfer speeds that this drive is capable of delivering. ... ... ... During the 11 years I've been running this Compaq 1800T laptop, I've used drives from Seagate, Fujitsu and now Samsung. If you're looking for a large capacity 2.5" IDE drive for an older rig, IMHO you can't do better in value and performance than this drive. 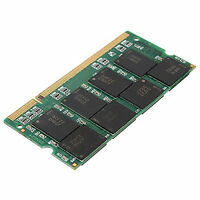 The Samsung 160GB 8MB cache (Model HM160HC) notebook IDE drive is one of the last parallel ATA drives being manufactured. Its design reflects years of refinements. It is quiet, fast, and very reliable. I have used them right out of the box and copied backup operating systems onto them, placing them directly into a new computer, and out the door in one hour flat. I have yet to see one fail to function. I have had failures with other brands, like Seagate, Hitachi, Fujitsu, and other second-rate manufacturers. The Samsungs are as good as the Western Digital line.